How do you honor your ancestors? If you were Chinese, you might celebrate Ching Ming. Dating back 3,000 years, the practice of Ching Ming is still observed worldwide by Chinese families. Ching means "pure" or "clean"; ming means "brightness." The words together are applied to a Chinese tradition that helps explain why respect for elders is such an important part of the Chinese culture. Many Chinese believe that a person's good fortune or misfortune comes from his or her ancestors; that all departed ancestors still have the same physical needs they had when alive; and that the departed can assist their relatives on Earth. Today, Ching Ming is celebrated every April 4 in Hawaii and involves the cleaning, repairing and replanting of ancestral gravesites. In Hawaii, the practice has a stronger presence than in other parts of the United States. 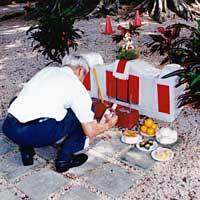 Ceremonies involve preparing foods as a symbol of earthly possessions and laying them out on the grave. These foods may include fruit, rice, chicken, pork, cakes and tea. A meal may be eaten at the gravesite as a gesture of sharing with deceased relatives. Other customs include burning incense, offering prayers and burning symbolic paper. It is not necessarily a time of sadness, but one of reflection, remembrance and communion with past generations.